I’m lucky to have had three sponsored book tours in Germany, a country I surprisingly fell in love with, given that my parents were Holocaust survivors. I was touring for several books including a memoir, My Germany, and I always had a terrific time, especially with my hosts in one city after another. I admire the serious book culture that exists in Germany and how authors are respected as cultural figures. I love the comfortable trains and the train stations with good food, great bookstores, and cheerful-looking flower shops. But I found certain things about traveling in Germany quirky, and that’s actually a good thing, because a book tour can be exhausting with the constant change of scene and because you’re working so hard. Without a sense of humor, you can really get worn down. Noting cultural differences is a fun distraction–and educational, too. Those same great trains and train stations have been a consistent source of amusement for me. No matter where I am or what train I’m on, even though an announcement might be delivered in German and English, the speaker always leaves out important content in English. The German announcement will apologize for a train being late in German but that won’t be repeated in English, and forget hearing anything about connections or even whether there’s a bistro or restaurant on the train. Without knowing German, you can miss a lot, and let’s face it, plenty of foreigners travel on Die Bahn. Hotels of all sorts there are a puzzle. Why are so many German beds so low to the ground? This isn’t a country prone to earthquakes — they really don’t have to fear falling out bed, do they? And what’s with German pillows? They’re mostly as soft as rags, which is why the hotel staff can arrange them in pretty shapes on the bed (triangles seem to be popular). Usually I need a handful of them to make for a somewhat restful sleep, or the hope of one. The beds are low but the showers are high. You almost always have to step up into the shower or bath tub which admittedly isn’t a big deal. But the dismount can be tricky when you’re all wet. And why are German toilets high, too? Are you supposed to be having elevated, philosophical thoughts on the throne because you’re in the land of Goethe? Maybe so. Let’s face it, Germany is Goethe-crazy. On one tour I ate at a Heidelberg restaurant Goethe mentioned in one of his journals, and the restaurant noted in its publicity material and in a mural on its wall that he almost slept at the inn there way back when. Almost. But even Germans make fun of their Goethe worship. In the university town of Tübingen, there’s a plaque indicating that Goethe puked there. What’s even funnier is that plenty of American tourists don’t realize it’s a joke. Lev Raphael loves travel and speaking foreign languages. He’s the author of twenty-five books in genres from memoir to mystery, and teaches creative writing online at www.writewithoutborders.com. I get that question all the time at readings. The answer doesn’t pop up immediately, because I’ve published in so many genres: memoir, mystery, literary novel, short story collections, psychology, biography/literary criticism, historical fiction, Jane Austen mash-up, vampire, writer’s guide, memoir-essay collections. I love them all, or I wouldn’t have written them, but my 19th book My Germany has a special place in my writer’s heart. It’s more deeply personal than my other books, and it’s also the one I struggled with most. 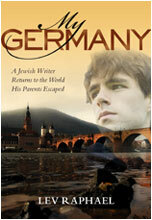 I’m the son of Holocaust survivors, and the book is a combination of history, family history, travelogue, mystery, and a coming out story. The thread that connects it all is my exploration of the role that Germany–real and imagined–played in my family while I was growing up and in my own life as an adult and an author. My Germany is also the book that garnered me the most speaking gigs of any book in my career: somewhere between fifty and sixty. That included two book tours in Germany where I spoke in over a dozen different cities, and sometimes even read from it in German, which I had started studying in night classes. Unexpectedly, I felt comfortable the moment I got to Germany and I remembered something I’d somehow completely forgotten: I grew up in New York’s Washington Heights neighborhood, where thousands of neighbors were German refugees from the Nazis. I’d been hearing German in the streets, in stores, in our building’s lobby and elevator since childhood. So suddenly plunging into a German-speaking environment wasn’t strange; it was comforting, it made me feel at home. That was one of the many surprises connected to writing My Germany, and it made clear to me the power that memoir has to connect you to your own past in new, revelatory ways. I was changing, which is why I had to write that memoir, and writing it changed me even more. A colleague once said that writing is a process of discovery; well, that book opened up new worlds for me, and having just taught an online memoir writing workshop this past month, I’ve seen memoir do that for my students, too. It’s thrilling. As one of the first American authors to publish fiction dealing with the experience of children of Holocaust survivors, I’ve been invited to do hundreds of talks and readings across the U.S., Canada, Western Europe, and Israel. I’ve appeared at a wide range of kinds of venues: colleges and universities, libraries, book fairs, synagogues, churches, and writers’ conferences. For my memoir/travelogue My Germany I did between fifty and sixty presentations alone. Being invited to be a speaker has been tremendously satisfying because sharing my experience as the son of two Holocaust survivors through my work has been a mission of mine for many years. It’s my personal tikkun olam, the term derived from Jewish mysticism which means healing the world. That label couldn’t be more wrong. My parents survived the Holocaust. I did not. They lost their homes and their countries, and dozens of members of their family were murdered. My mother was in a slave labor camp at the end of the war–but before that she was in a ghetto and a concentration camp. My father was a slave laborer for the Hungarian army and wound up near the war’s end in Bergen-Belsen. Each one witnessed and survived horrors that are staggering to contemplate. Many children of Holocaust survivors, known as the Second Generation, cope with a difficult legacy. Growing up with parents who survived horrific events is very complicated because it can feel like living in a minefield. Your parents may or may not want to talk about what they endured, but either way, it’s easy for you to say or do the wrong thing and enrage them, or make them cry. While their own childhoods were normal, their childrens’ aren’t because their parents are coping with mammoth trauma and loss. Psychologists have studied the Second Generation and found many of us have problems ranging from anxiety, depression, and a predisposition to PTSD, as well as issues with relationships, self-esteem, and identity. I’m proud to have keynoted several international conferences bringing together children of Holocaust survivors, child survivors of the Holocaust, and their allies. And I’m glad that there’s been an international audience for my work. But if I labeled myself a “Second Generation Holocaust survivor,” I would be blurring important distinctions. I would be elevating any personal trauma I grew up with and making it equal to what my parents suffered. It isn’t. It never will be. In early April 1945, my father was packed into a train with 2,500 other prisoners from Bergen-Belsen as the Nazis insanely tried to keep British and American troops from rescuing them. The train was made up of 45 cars with their doors sealed shut; the crowding was horrific and of course there was no food or water. In the chaos of war, this hellish train wandered for a week and finally stopped not far from the Elbe because the commander couldn’t get clearance to move across that river with communications so disrupted. He fled ahead of the American troops he knew were coming and the remaining guards escaped when two American tanks appeared on April 13th. The troops that had found this train were racing to the Elbe because it was the last barrier to their advance across Germany. Now they had a totally unexpected burden of some twenty-five hundred prisoners to house and provide for. The answer was about nine miles to the west. American troops had just captured several hundred Germans at the Wehrmacht base and proving ground in Hillersleben where tests had been conducted for giant railway guns manufactured by Krupp. It was an ironic place for Jews to be sheltered, cared for, and brought back to life. But then what place in Germany wouldn’t have been? This verdant military setting with clean, heated quarters for officers and soldiers was a virtual paradise for people who had been treated like animals for years. That’s where my parents met and fell in love. My mother was in Hillersleben because she had escaped from a slave labor camp in Magdeburg 16 miles away and been brought there by American troops now using it as a temporary Displaced Persons camp. She and my father had each lost everything in what would come to be called the Holocaust: home, families, countries. There wasn’t any time to play pre-war games. “Do you like me?” he asked. She did, and as my father tersely put it years later, from that moment on, “She was mine and I was hers.” My mother moved in with him that night, beginning their fifty-four years together. I’ve had the honor of meeting Frank and shaking his hand. On Memorial Day, with the survivors of the Holocaust and their saviors dwindling faster and faster, it’s more important than ever to remember these heroes. The account in this blog is drawn from My Germany: A Jewish Writer Returns to the World His Parents Escaped. On my last German book tour for my memoir My Germany I was reminded of what a rich book culture that country has when I browsed in crowded book stores at the train stations, and studied billboards–yes, billboards–for all kinds of books, not just thrillers. And speaking at Justus Leibig University in Giessen north of Frankfurt, I heard about a remarkable diary that had just been published in German and is finally available in English from Cambridge University Press. The devastating book by Friedrich Kellner is the diary of a court clerk in a small German town in the western state of Hesse. The German title translated as All Minds Are Clouded and Darkened; the author’s own title was My Opposition (Mein Widerstand), which is how it’s appearing in English. This diary makes it very clear that despite any claims to the contrary, ordinary Germans during the War knew a great deal about what was being perpetrated in their name upon the Jews and every other victim of the Nazis. It’s simply not true that people did not talk about what was happening, or were so terrorized by the Nazis that they were completely blind to events around them, or silenced. Conversations on these subjects may not have been public, but they were widespread. He was remarkably prescient in foreseeing post-war denial: “Those who wish to be acquainted with contemporary society, with the souls of the ‘good Germans,’ should read what I have written. But I fear that very few decent people will remain after events have taken their course, and that the guilty will have no interest in seeing their disgrace documented in writing.” The diaries go from the beginning of the war in 1939 to just past its end and offer an unparalleled entrance into the years of Nazi destruction.